A piece of New Orleans’ French Quarter has been transplanted to the prairie at Pappadeaux Seafood Kitchen. 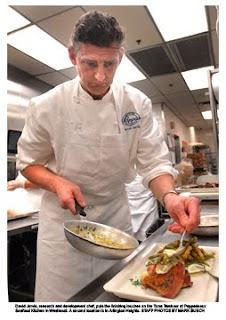 “Coastal seafood” describes the menu’s emphasis, says David Jarvis, the restaurant’s research and development chef. He notes Cajun favorites are featured, but so are eclectic offerings for varied palates. Live lobster inhabit a tank at the entrance. A nautical theme carries through to the lively decor, which includes mounted fish representing many of the varieties on the menu. The tin ceiling and other architectural touches were brought in from New Orleans for the Westmont location, whose spacious dining room has landscaped garden views. Mementos paying homage to Louisiana adorn the attractive brick walls. David Jarvis, research and development chef, puts the finishing touches on the Tuna Tambour at Pappadeaux Seafood Kitchen in Westmont. A second location is in Arlington Heights. On Friday and Saturday evenings, a Zydeco band strolls among the tables. “They’ll do requests for certain songs,” says Manager Peder Clausen, noting the ambiance is lively. He says the privately held parent company is focused on bringing value to the table. In addition to promotions on lobster and oyster dishes, diners will be offered new choices in serving sizes. A fan of Cajun cooking, Engel says he’s looking forward to the boiled crawfish offered around Mardi Gras, but adds his regular favorites are the Crawfish Etouffee in lemon garlic butter sauce, and the Blackened Catfish on Dirty Rice.